State Comptroller Micha Lindenstrauss submitted his report on the Carmel Fire to Knesset Speaker Reuven Rivlin on Wednesday. The full report is to be published at 4:00 p.m.
Jerusalem sources indicate the report is expected to assign responsibility for the massive blame to Interior Minister Eli Yishai and Finance Minister Yuval Steinitz. The two men are allegedly going to be blamed for the country's lack of preparedness that led to northern firefighters not having the necessary resources at their disposal with which to control the blaze. Prime Minister Binyamin Netanyahu and Foreign Minister Avigdor Lieberman appealed to friendly foreign nations for firefighting assistance. In addition, IDF soldiers mobilized to support the firefighters in their efforts as well. 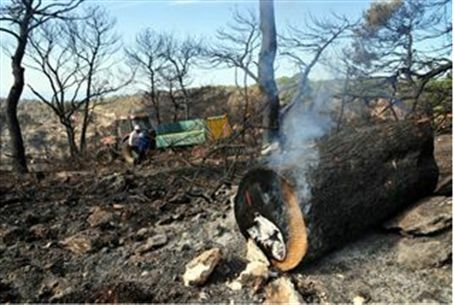 The inferno that raged across the Carmel mountain range in northern Israel ignited on December 2, 2010. At least 17,000 people were evacuated from their homes, and more than 50,000 dunams of forest land (12,000 acres) were destroyed. The blaze left 44 people dead, most of them newly-graduated cadets who worked for Israel's Prison Service. The cadets were trapped in a bus that was heading to a prison in order to evacuate Arab prisoners who were at risk of being caught in the fire. Instead, the bus carrying the cadets became surrounded by a wall of flames, and they were burned alive. Deemed the deadliest blaze ever to strike the State of Israel, the Carmel fire lasted four days. It was finally extinguished with the aid of firefighters who came to help Israel from all over the world, and included a contingent from the Palestinian Authority as well.